My city has frozen over! 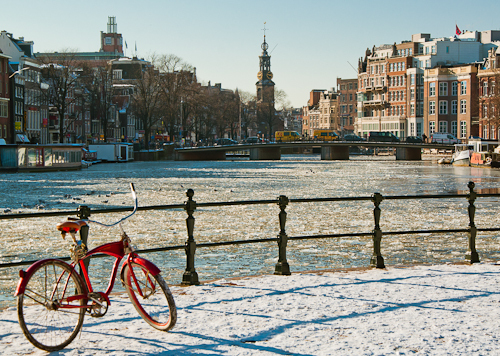 Amsterdam has had minus temperatures for a week and with the snow earlier last week, the city has turned into an iced over metropolis. It seems that everyone has abandoned the streets and are now using the canals for their main pedestrian zone. Each time I bike over a bridge I turn my head to see how beautiful the canals look frozen over or see the ice skaters gliding along. With the winter chill on, I got creative with some seasonal flavors. 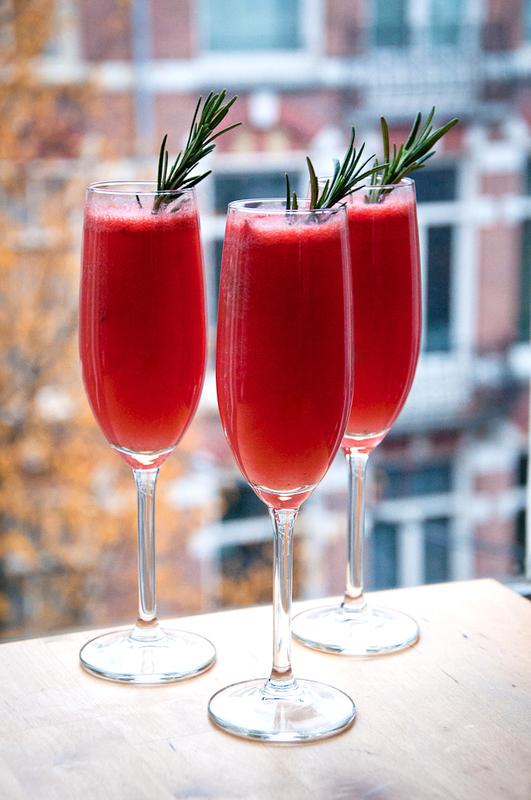 Having the rosemary soak in fresh pink grapefruit juice overnight gives almost a douglas fir scent to these cocktails. Enjoy as a winter juice or lovely cocktail! Blend the pink grapefruit juice and agave. Add 5 rosemary springs and let soak overnight in the fridge so that the grapefruit juice absorbs the rosemary flavor. To serve, pour champagne glasses 1/2 to 3/4 full of the grapefruit mixture and top with sparkling water or Grey Goose Vodka. Garnish with a sprig of rosemary. 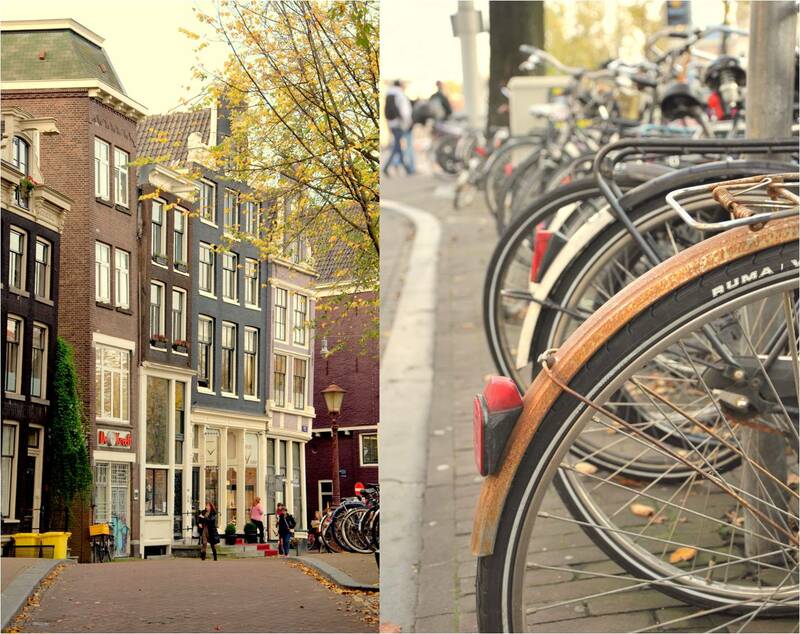 The Kitchen has moved to one of the most amazing cities to live in within Europe, Amsterdam! This liberal minded Dutch city is more than what people initially think when they hear the name. Amsterdam is about boating down the beautiful canals, the tall slender houses that seem to look down on you that line them, the funky café tucked away in every alley and of course the Dutch and all the international people that fill this city. 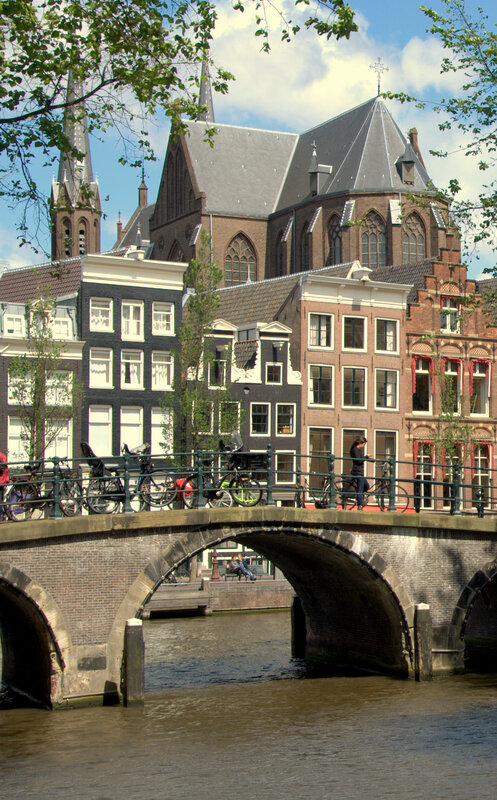 There is nothing I love more than riding my Dutch bike along the bricked paved roads with friends as we move from café to café enjoying conversation and take in the atmosphere of the city. Everything about this city makes me happy! 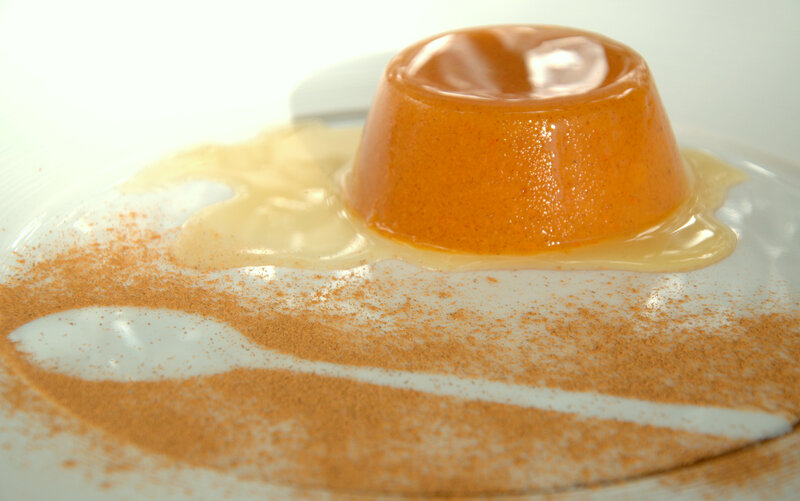 So for tonight’s dessert I am serving friends this incredibly simple and light Persimmon Gelée. Any fruit can be used but persimmons have a sugar sweet taste that many autumn fruits do not possess. Plated with honey and dusted cinnamon, this light and tasty dessert is how I describe Amsterdam: beauty in enjoying the simplistic things in life! Mix the hot water and agar-agar, set aside to cool to body temperature. Blend the persimmon until completely smooth and mix with the agar-agar mixture. Once it sets the sweetness will lesson. Pour equally into 4 silicone cupcake molds and let sit on the counter or in the fridge for 1-2 hours. Serve with honey or agave nectar drizzled over the top and dusted cinnamon. Hello my lovely and patient readers! The kitchen has been in major transition with several months of traveling and moving to a new European city! So I’m writing you from my new home here in Amsterdam. But before we dive into my love affair with this new city, I have plenty to catch up with and my first post from this long pause is inspired by my travels through Tuscany! I ventured through Sienna, Florence, Lucca and Pisa in May with my number one traveling partner, my mummy and I must say…all we did was eat! But in between meals we strolled down the alleys that were barely large enough to fit a car and piazzas lines with fountains. Although each city was incredibly different, they each had their own form of Tuscan traditions, food, history and charm. So while I was in this region of Italy, I fell in love with 2 things: almond flavored desserts and figs! So everyone takes something different away from their travels through Tuscany and for me it is this Tuscan Frangipane with Figs. The frangipane hits your mouth with several flavors with the sweet almonds, lemon zest and vanilla bean. Topped with figs, thyme, and orange zest, this lovely dessert will impress all guests with the diverse flavors of all things that are Tuscan! Blend all the ingredients for about 30 seconds or until smooth. Pour into a container and let set in the fridge for a few hours or overnight to allow the flavors to open up. Once ready to serve, equally pour into 2 wine glasses. Cut each fig into 4 segments. Top each wine glass with the 4 fig segments and sprinkle the orange zest and thyme over the top. Serve immediately. This weekends adventure took me to Potsdam outside of Berlin. 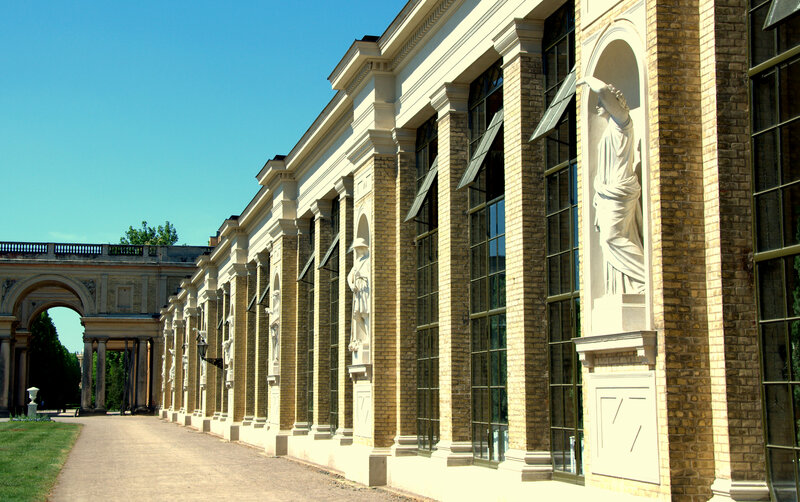 Potsdam means ‘beneath the oaks’. 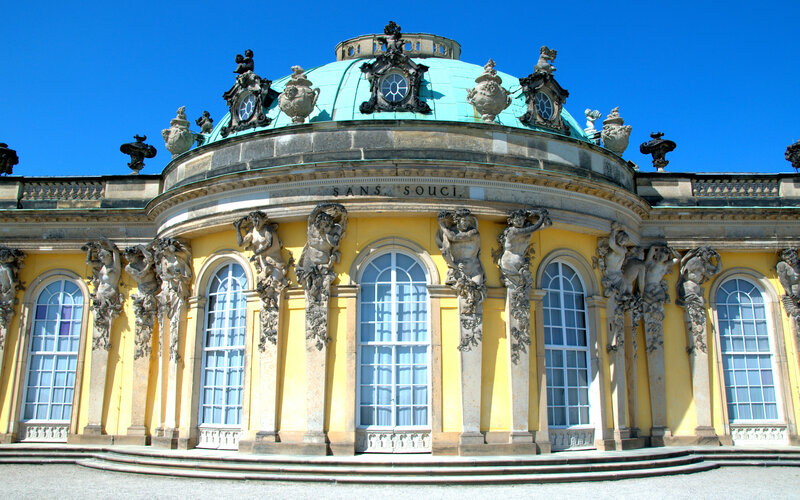 My cousin was adamant about showing me Sans Souci in Potsdam, the summer palace of Frederick the Great, King of Prussia. 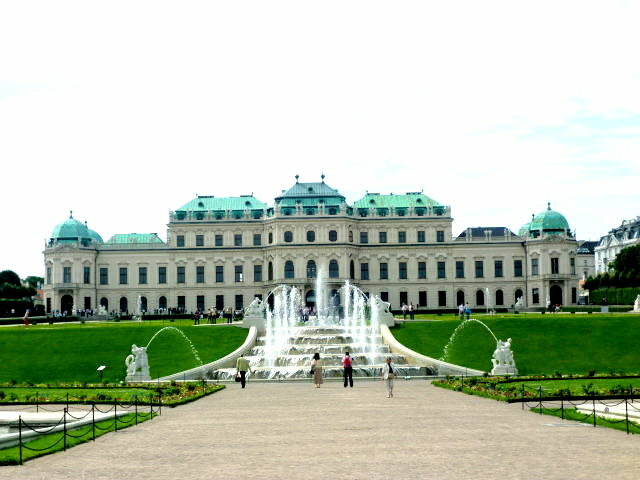 The palace is often considered the German rival of Versailles. King Frederick wanted a private residence where he could relax away from the Berlin court. The palace’s name Sans Souci, is a French phrase which translates into “without worries” thus symbolising that it was a place for relaxation rather than a seat of power. Of course I brought plenty of goodies for my cousin and I to enjoy. These raw Chocolate Mint Bites are the perfect little chocolatety flavored treat with a light mint taste. I packed up 2 dozen for the trip and we finished them all in 2 days! In a bowl blend the carob/cacao powder, almond flour, vanilla powder and salt and set aside. Using a personal blender, blend the mint, agave, and water until the mint is completely liquified. Add the dates and blend until completely smooth. Mix the wet ingredients to the dry ingredients with a spatula. Empty onto a dehydrator sheet and smooth out to a square shape of about 1/2 inch thickness. Dehydrate overnight or for 10-12 hours. Flip onto a cutting board and square the edges off. Cut into 1 inch squares and dehydrate for 2 more hours. Enjoy with a glass of Almond Milk and store the remainder in an airtight container. Spring is in full swing here! Flowers everywhere you look are in full bloom, the trees are no longer bare and everyone is out riding their bikes or having picnics in the park. So this Easter weekend with my cousin visiting and we rode all over the city on bikes, met friends and took in the sun on the balcony. One thing he asked me before he came was to try more of my raw food desserts. So always eager to feed people my raw food creations, I whipped up a batch of these little Carrot Fairy Cakes (mini cupcakes). These are the perfect double bite size treats. He couldn’t believe how flavorful and sweet they were, he kept opening the fridge and snatching up another one! This Carrot Cake recipe is just like the bakes version with a soft fluffy sweet carrot cake with raisins and walnuts but frosted with zingy lemon cream frosting. The only thing missing from these delectable little fairy cakes is the guilty conscience! Add all the ingredients in a bowl and massage together to blend. Shape into 1-2 tbsp size balls and lightly press into the fairy cake molds. Set in the fridge until ready to frost. In a personal blender, process the cashews into a flour. Add the rest of the ingredients and blend for a few seconds. The frosting should have the consistency of yogurt. Using a teaspoon, spoon the frosting over the top of each fairy cake and smooth over the sides with the spoon. Place in the fridge until ready to eat. Sunday was the warmest day of the year so far! So in celebration, I pulled out the balcony furniture and juiced up this Apple Mint Schorle to enjoy while I take in some sun! Apple Schorle’s are a very popular beverage in Germany that can order in any bar or restaurant. 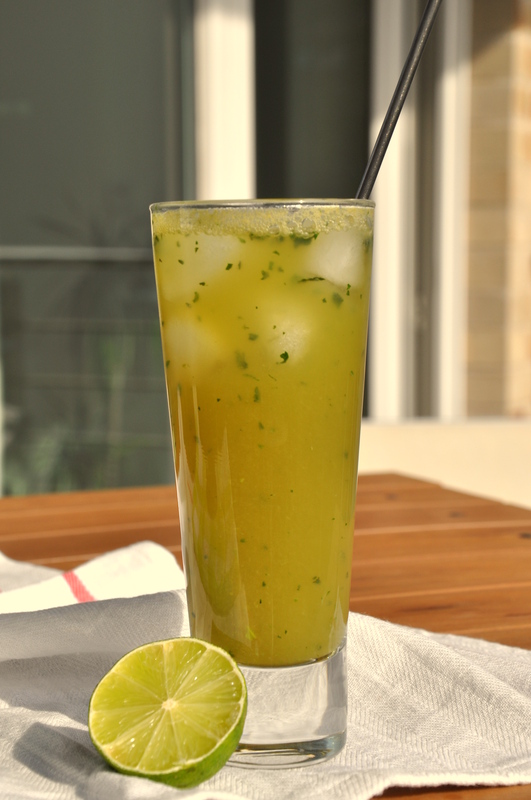 With a few extra green ingredient, this Schorle is perfect balcony cocktail with it’s fresh pressed apple juice, lime tanginess and fresh mint! My tongue was dancing…and so was I with my dog in the sun! And of course I didn’t forget St. Patrick’s day is this Thursday! So celebrate the holiday with this gorgeous green potion! Chop and juice the apples, celery and lime. Add to a blender and blend with the mint leaves for 20 seconds on low or just until the mint leaves are in tiny mm pieces. Pour into a sealable 1 liter size juice container so that you are able to shake the juice before pouring as it separates. 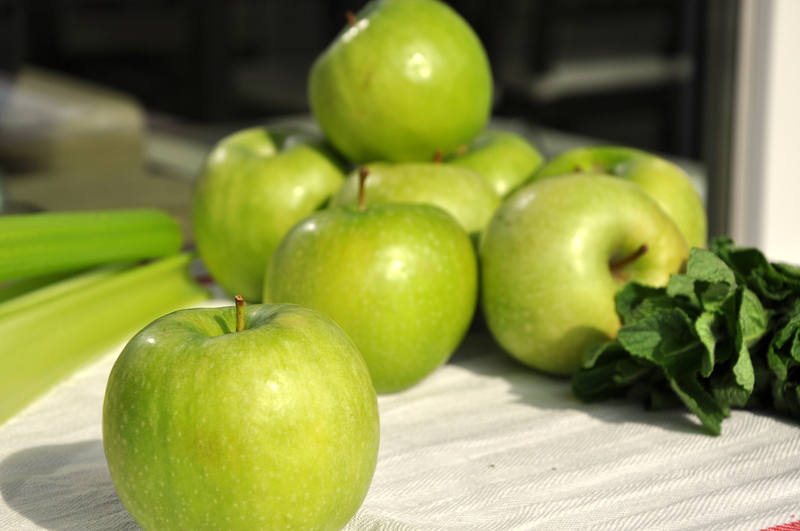 To serve, in a tall glass pour half of the Apple Mint juice (always shake before) and half sparkling water. Add 3-4 ice cubes and top with a straw or cocktail spoon as this will separate and you want to be able to stir it throughout your enjoyment! As I stared at my fruit bowl looking for inspiration for this post, it hit me, Orange Creamsicles Tarts! I loved Orance Creamsicles when I was young. So with 4 straight days of fog and the weekend with a clear blue sky, I set to work creating in the kitchen and snapping photos outside with my new Nikon. There is a beauty to where I am living, I only need to walk outside my house to enjoy nature. 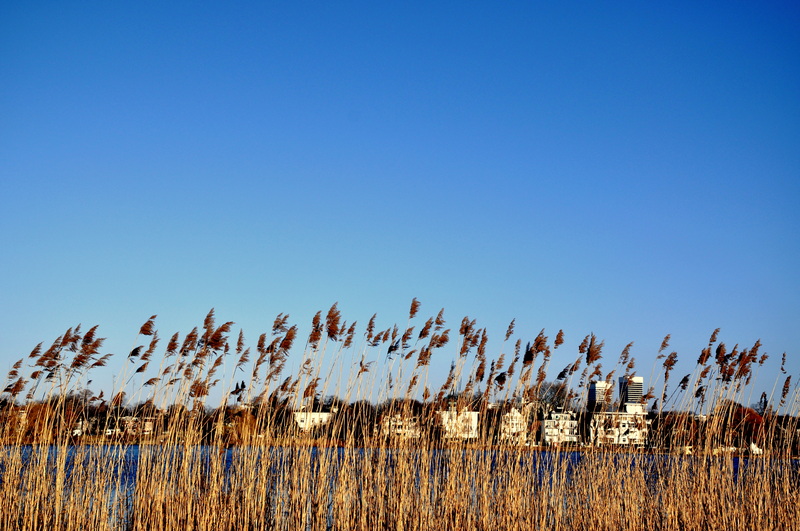 Below is looking over to the houses on the other side of the Alster Lake. And here is a lake in the Alster Park. 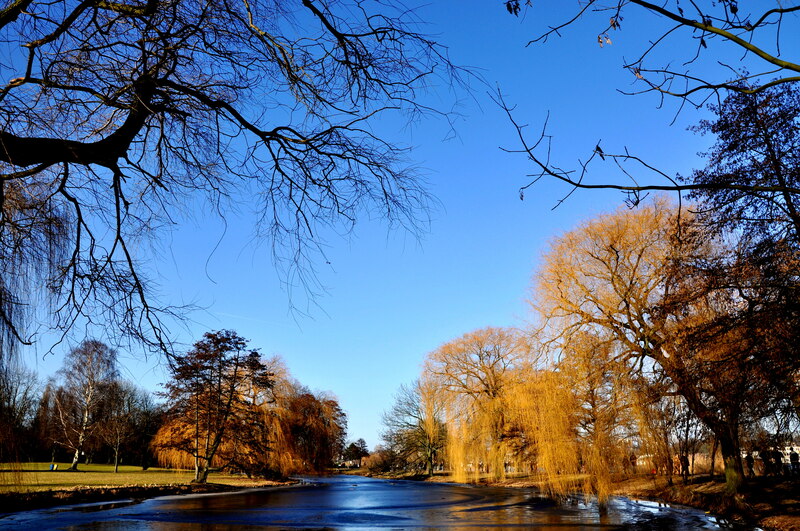 It was so stunning to see how the trees seemed to almost protect the lake from any disturbance. Once I returned home, I dove into photographing my new dessert. These Orange Creamsicle Tarts have the same smooth sweet orange flavor with a delicious chewy Macaroon Crust. They are so gorgeous to serve and taste even more divine! And if you would like to see our new daily photography blog that I am participating in along with my super artzy friend Meghan, please visit facedailyphotos or become a fan on facebook. Process the coconut and cashews in the food processor until a meal forms. Add the rest of the ingredients and process until the dough becomes sticky. Measure a heaping 1/2 c of dough into each tart tray. Press into place being sure to create a few mm crust around the sides. Let sit in the fridge while you prepare the filling. Blend all the ingredients until completely smooth. Depending on how sweet or bitter the orange juice is, adjust to taste. The flavor should be one that is lightly sweet with a creamy taste. Either add more orange juice or agave to achieve your desired flavor. 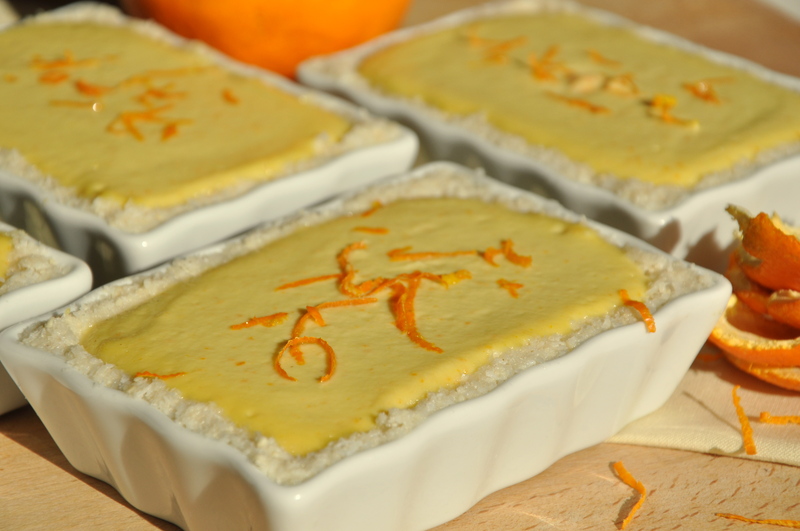 Pour into the 4 prepared tart trays and let set in the fridge overnight as the orange zest flavors will give the cream a more intense flavor. Sprinkle a few long zest strips over the top and serve. Happy 1st Birthday the Bee’s Knees Kitchen! It has been an eventful year here in the Kitchen. Never would I have believed how many followers the kitchen would have or all the encouraging comments it has received. 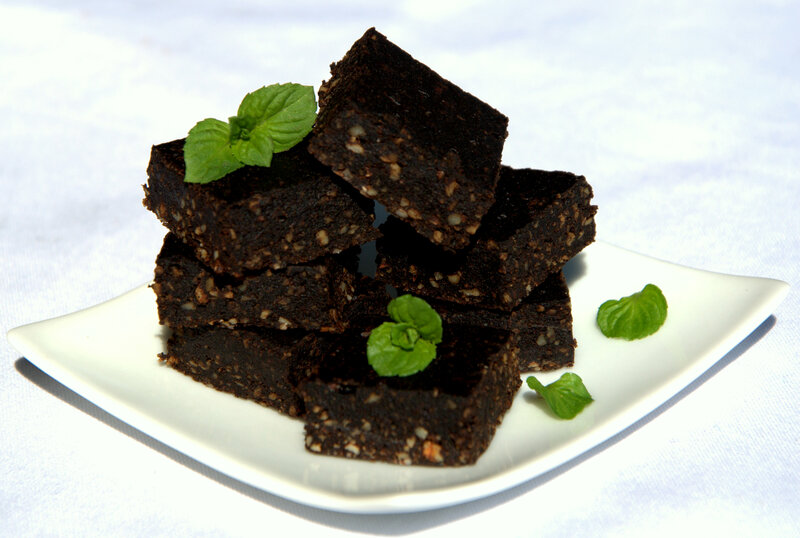 I will keep making tasty raw food recipes that look as beautiful and appealing as ever. Thank you to everyone who has commented, subscribed and read the blog! So we have several ways we are celebrating this year, first, the Bee’s Knees Kitchen now as a fan page on facebook. So please become a fan so you can be updated on new mouth watering photos and posts. And second, the beautiful Eva at Uncooking 101 has been so lovely to feature a week of my recipes starting from the 28 February! So as a special birthday treat, I would like to present you with a simple dessert, the sweet and tangy Lemon Sweet Cream with Winter Fruit. This time of the year it is always a challenge with the limited array of winter fruit available here in frozen Northern Germany. 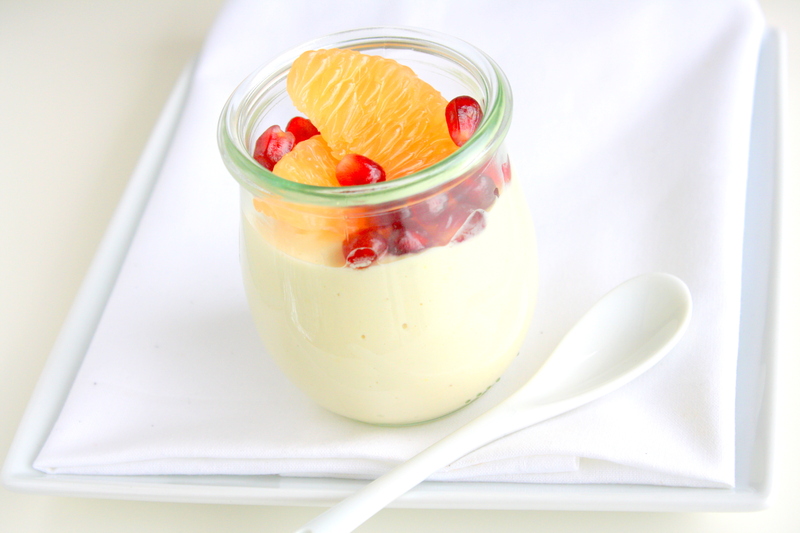 But the pairing of the sweet, crunchy pomegranate and tangy grapefruit is perfect for your taste buds with the lemon sweet cream. So add everything to the blender, pour into jars and top with fruit, and celebrate with us! Blend all the ingredients until completely smooth. Pour into 4 jars, glasses or 1 large bowl and let set in the fridge for 1 hour. 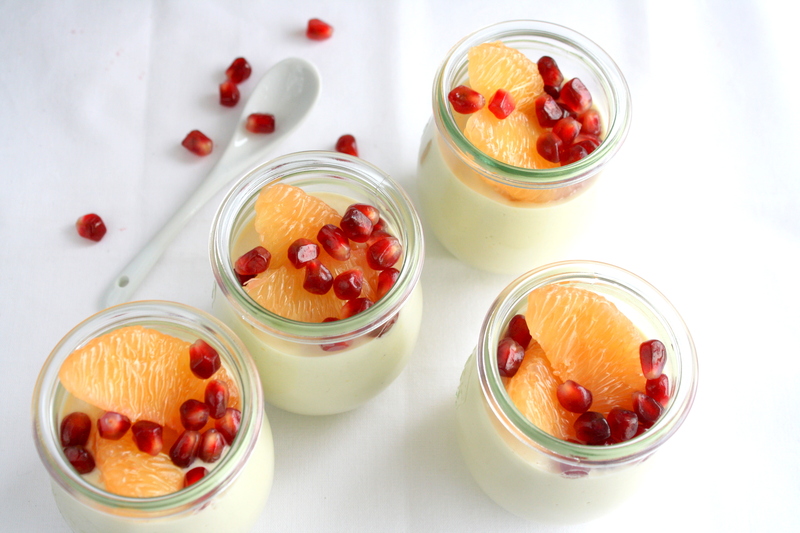 Top each jar, glass or the entire bowl with the grapefruit and sprinkle the pomegranate arils over the top. With Valentines Day only a week away I thought it would be appropriate to make my favorite Dark Chocolate Strawberries! These delicious little devils took a total of 5 minutes to mix and dip. The dark chocolate sauce has the most intoxicating rich chocolate flavor. So make, eat, and love! QUESTION for all readers: Do you think Valentines Day is the day to express love for your loved ones or a day made up by corporations to make money?? In a glass bowl, blend all the ingredients in the order above. If the chocolate becomes too thick, put the glass bowl in a warm water bath to re-melt the cacao butter or coconut oil. Holding the strawberry firmly by the stem dip 3/4 of the strawberry in the chocolate sauce. Rotate in the chocolate but do not completely cover as you want to show a bit of the red from the strawberry. 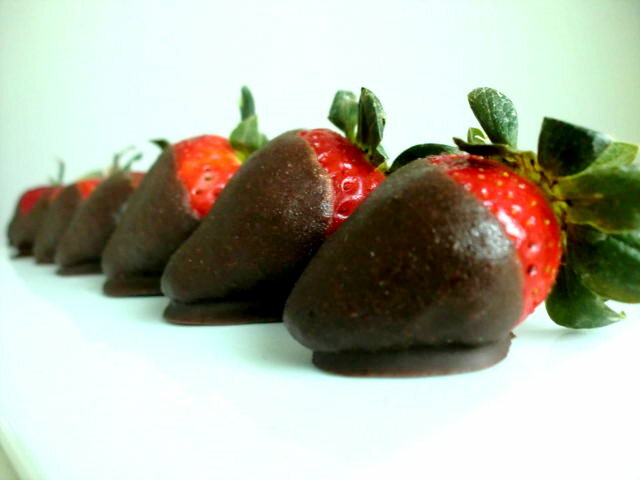 Place a piece of wax paper on a cutting board for all the chocolate dipped strawberries to lay. Pop in the freezer for 3-5 minutes to allow the chocolate to harden. 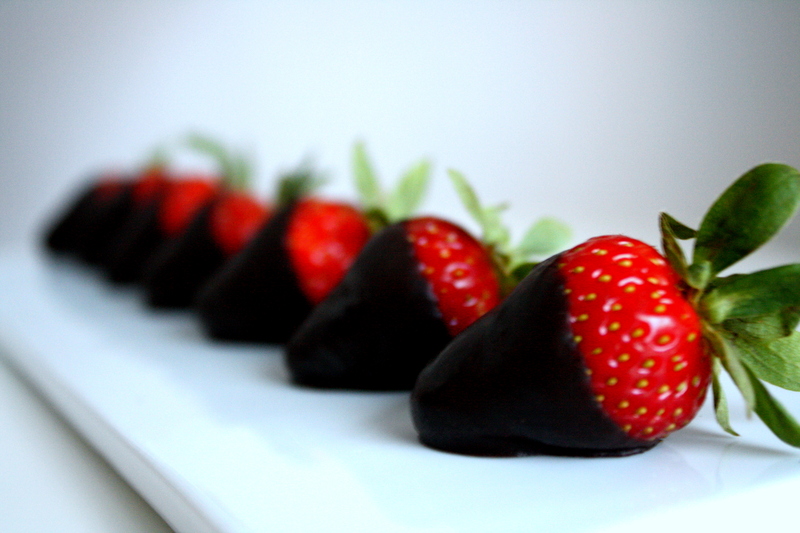 Serve on a white plate as this will bring out the color and draw the eye to the red strawberries and dark chocolate. 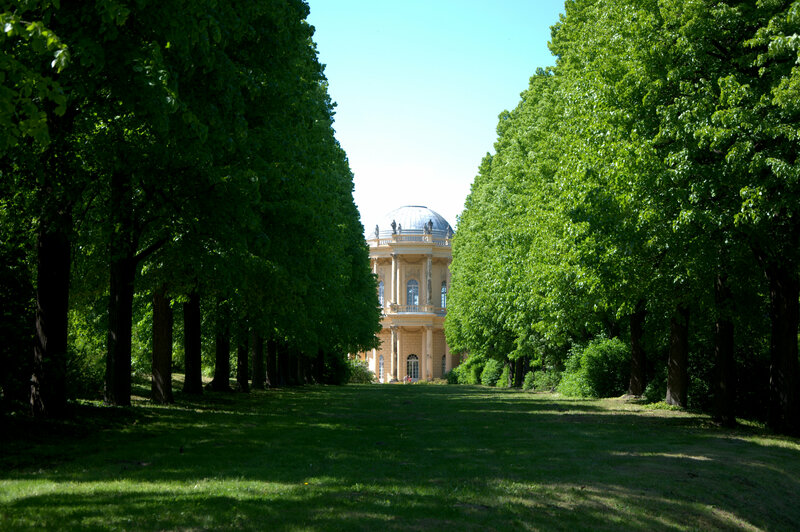 Vienna, home of breathtaking architecture, grand palaces, Mozart’s music and the Sacher Torte! While I was researching a trip to Vienna I stumbled upon this delectable dessert which is served at the Sacher Hotel and added it to my list of things to see. I had planned the trip for my mother, my dog and me to hit as many sites as we could in 3 days. One thing I hadn’t planned for which was a pleasant surprise was the Stadtfest (city festival) at the Rathaus (town hall) square. The Stadtfest hosted a large festival with music, food and entertainment that went through evening. We spent much of the first day outside enjoying the Stadtfest and Viennese culture. The most stunning photo I took of Vienna was the Rathaus lit up like a candle at dusk. During the trip we spent the days seeing the magnificent sights such as the Stephansdom the cities prominent gothic cathedral, the Naschmarkt market “the belly of Vienna” where we bought most of our meals and 3 of us walked the grounds of the 2 Belvedere Baroque palaces (Upper Belvedere below). We also touring the inside of the Neo Renaissance Staatsoper (city opera) with Olive my dog tucked in my bag. 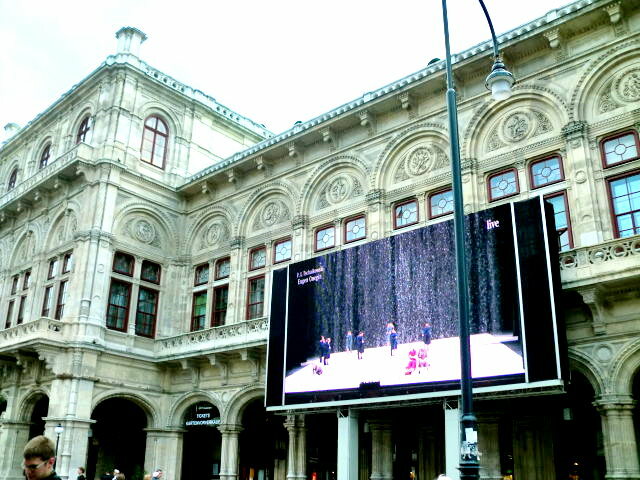 Shortly after our tour ended we headed outside to watch the opera on the big screen hanging on the exterior of the Staatsoper (below). The city is very proud of its culture and likes to make the it accessible to all Viennese and tourists. While my mother loves the opera, my eyes started to wander and notice the Sacher Hotel across the street. We headed over and found that the Sacher Torte is the most famous Viennese culinary speciality invented by Franz Sacher in 1832 for Prince Metternich to serve to his guests. My raw version follows the same guidelines as the original with two thick layers of chocolate cake, an apricot jam center and smothered in rich chocolate frosting! 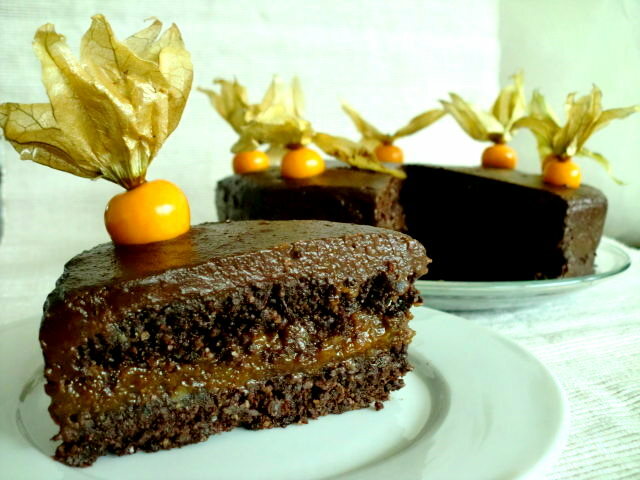 It is wonderfully rich and chocolatey without being too sweet and looks gorgeous topped with Cape Gooseberries. It was such a hit last weekend at a Raw Food Potluck in Hamburg that I had to jump the queue in order to get a slice! Blend half of the apricots, lemon and water in a personal blender. You might need to give it several sakes while it is blending as it is a thick paste. Empty into a bowl and repeat with the other half of the ingredients. Empty the rest into the bowl and set aside. Process the walnuts halves until a course meal is formed or dump the walnut meal in a food processor. While the food processor is processing on low, slowly pour in the cacao or carob powder and salt. Stop the food processor and scrap down the sides. Turn the food processor back on low and add the dates one at a time. Once the dates are completely incorporated, dump the cake dough into a large bowl. Divide the dough as equally as you can and add half to a 8 inch spring pan. Be sure to wipe the spring pan with coconut oil so the dough does not stick. Lightly press the dough into place being sure to create a flat surface. Pour the Apricot Jam over the top and smooth over. Let set for 1-2 hours in the freezer until the Apricot Jam is firm but not solid or frozen. Dump the rest of the cake dough over the top of the Apricot Jam layer and press lightly into place. Let set for 1 hour in the freezer or in the fridge until you are ready to frost the cake. Process the avocado and dates in a food processor until only a few lumps remain. Add the water then the cacao or carob powder. Check for sweetness and add stevia accordingly. You might need to process the frosting more and add additional water, a tablespoon at a time if it is still too lumpy. Once the frosting is smooth, dump into a medium size bowl. To frost the cake, remove the spring pan side and place on a cutting board. Add half the frosting to the top and slightly smooth over. Add more to the sides using an offset spatula. Once you have frosting on all sides of the cake, use the offset spatula to smooth over the sides while you turn the cutting board to rotate the cake. Smooth over the top surface and top with Cape Gooseberries with the husk turned inside out for a beautiful effect.